JPMorgan CEO Jamie Dimon disclosed significant losses during a conference call on Thursday. NEW YORK (CNNMoney) -- JPMorgan Chase, in a surprise announcement, said Thursday that it has suffered trading losses of $2 billion since the start of April. The group that suffered the losses is part of the bank's so-called corporate unit, and had been making trades designed to hedge against risk. Net losses, after factoring in other securities gains, are expected to exceed $800 million by the end of the second quarter. And losses could increase depending on market conditions and the bank's actions moving forward, CEO Jamie Dimon said. Shares of JPMorgan (JPM, Fortune 500) fell 9% in early trading Friday. Dimon, speaking to analysts and reporters on a conference call, said the losses were caused by "errors," "sloppiness" and "bad judgment." "This was a unique thing we did," Dimon said. "Obviously it had a lot of problems. It was a bad strategy. It became more complex, it was poorly managed." Last month, rumors swirled around a JPMorgan employee based in London who had, according to the Wall Street Journal, been taking large positions in credit default swaps, the insurance-like bets that blew up in the 2008 financial crisis. The employee was said to work in the bank's Chief Investment Office. Dimon was extremely agitated on the call Thursday with analysts. In response to repeated questioning, he said: "I don't know how many times I can say this." Banking analyst Mike Mayo at investment firm CLSA asked whether the losses were due merely to "terrible execution" or also broader market forces. "In hindsight, this was bad execution, bad strategy, but also the environment -- because this is mark to market," Dimon said. "But I just don't want to make excuses." Mayo pushed on whether market conditions were to blame, asking Dimon whether he thought other banks could be in the same situation. "I don't know," Dimon replied, sighing audibly. "Just because we're stupid doesn't mean everyone else was." Still, investors appeared on edge as shares of Wells Fargo (WFC, Fortune 500), Goldman Sachs (GS, Fortune 500), Bank of America (BAC, Fortune 500) and Morgan Stanley (MS, Fortune 500) were all down around 2% after hours. Finally, Mayo asked Dimon what he should have paid more attention to in hindsight. "Trading losses," Dimon said simply. "Newspapers." Another analyst asked about the "terrible" timing of the loss, given the debate over the Volcker Rule. 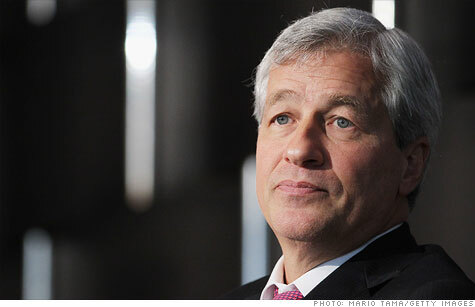 "It's very unfortunate ... it plays right into the hands of pundits out there, but that's life," Dimon said. Earlier in the call, he said: "It didn't violate the Volcker rule; it violated the Dimon principle." Still, the loss could weigh heavily on the bank's net profits, especially if losses in the CIO unit accelerate, something Dimon said is quite possible. Last quarter, the bank earned $5.4 billion and hauled in revenue of $27.4 billion.